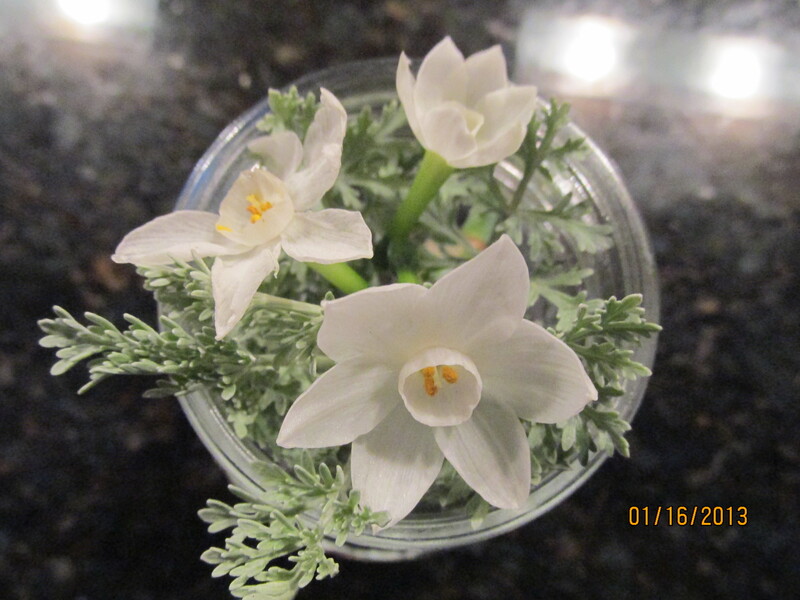 In recent years, I enjoyed forcing Paperwhite narcissus in the period after Thanksgiving and before Christmas – the flowering of Advent, if you will. I never planted just one container, pushing the ugly, papery bulbs into pebbles and keeping them in just the right temperature and light until strong white roots appeared. It became my habit to prepare at least half a dozen bowls of them to scatter around and share with family and friends. This year, whether by blatant omission or intentional effort to simplify, I didn’t buy any Paperwhite bulbs, although I have delighted in watching the green spears poke up and begin to bloom in the past. This morning, celebrating a day of sunshine after some long dreary days with pewter skies and everything dripping with rain, I walked around the garden thinking to plan what needed to be dug up, pruned, and cleaned up in the next weeks. I began to see spots of color where the roses had responded to the rain, little things here and there that survived the frost, a single snapdragon, berries on the holly and hawthorne, and almost buried in wet leaves, one single stem of Narcissus. It was as if I were being told “You didn’t have to do it, I took care of it for you.” And one was enough. While many of our friends and family are wearing their warmest outdoor gear and shoveling snow, we have had a succession of cold, wet days that seemed to be just what the roses needed to cheer us with round mounds of fragile petals. I brought these inside more for their exquisite fragrance than for their beauty. I knew they wouldn’t last very long in the dry warm air of my kitchen, and they didn’t. 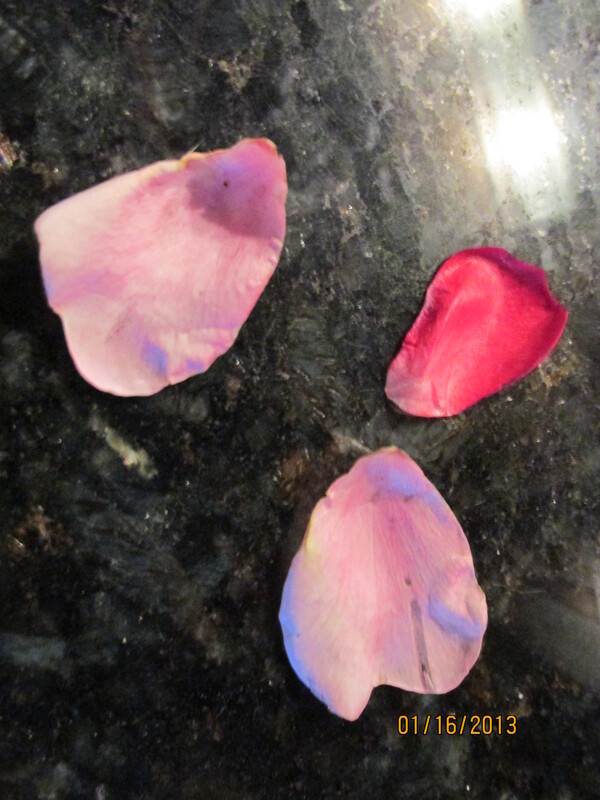 At least, the blooms didn’t, shattering petals almost as soon as I put them into water. But their scent remains. I am grateful for the reminder of beauty experienced in ways other than my eyes and the lingering of joy – the way a phrase of song runs through my mind for days after it has been sung, the warmth of touch remaining after a hug, the smile that stays on my face even though the telephone conversation has ended.